Italian culture values tradition over anything else. Birra Moretti is one of the most popular Italian beers, originating from the Friuli region. 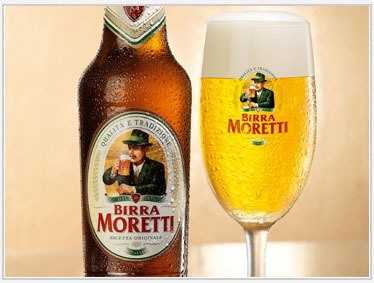 The brewery was established in 1859 in the town of Udine by Luigi Moretti prior to the Italian unification. Currently the business is owned by Heineken, and is exported to over 40 countries worldwide. Who is the man with the moustache on the label? 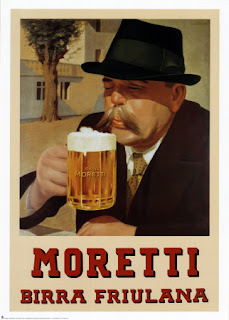 Birra Moretti had been popular in the Friuli for over 80 years before their iconic logo was introduced. In 1942, Commander Lao Menazzi Moretti saw a man sitting outside an Inn, the Boschetti di Tricesimo. The character represented the qualities he wanted his family’s beer to possess: tradition and authenticity. The photograph was first seen in a promotional poster, and was later shown on the label of the beer itself. This recipe is a twist on the classic Tiramisu. The name literally translates to “it lifts me up”. Using beer in place of the espresso may have the reverse effect. Be sure to use a rich, full-bodied stout with chocolate or coffee flavours. Try Aphrodisiaque from Dieu du Ciel, Young’s Chocolate Stout, or Rogue Mocha Porter. Beat together egg yolks and ½ cup sugar in a large bowl with an electric mixer at medium speed until thick and pale, about 2 minutes. Beat in mascarpone until just combined. Beat whites with a pinch of salt in another bowl with clean beaters until they hold soft peaks. Gradually add remaining ¼ cup sugar while beating. Continue to beat whites until they just hold stiff peaks. In a separate bowl, beat cream in until it reaches the soft peak stage. Gently fold cream into mascarpone mixture, followed by egg whites. Stir together stout and Kahlua in a shallow bowl. Dip each ladyfinger in stout mixture, soaking for 4 seconds on each side. Transfer to an 8-inch glass baking dish or decorative bowl (2-quart capacity). Arrange in bottom of dish, trimming as needed to fit. Spread half of mascarpone mixture evenly over ladyfingers. Make another layer of stout-soaked ladyfingers in same manner. Top with remaining mascarpone mixture. Cover dessert and chill for at least 6 hours. Just before serving, sprinkle with sifted cocoa powder.